chronic rhinosinusitis, olfaction, olfactory threshold, endoscopic sinus surgery, nasal polyps. Chronic rhinosinusitis (CRS) is characterized by a long-time inflammatory disease of nasal and sinus mucosa . Olfactory dysfunction is common among CRS patients with a prevalence ranging from 48% to 83% [2-5]. Some previous studies believe that medical therapy is beneficial for improving olfactory function in CRS; nevertheless, endoscopic sinus surgery (ESS) is the treatment of choice in CRS patients who do not respond to medical therapy [1,6]. The effect of ESS on improving olfactory dysfunction has remained controversial due to lack of comprehensive evidence. Range of improvement has been reported from 25% to100% according to some prior studies; while others have reported no improvement or even reduced olfactory function following ESS [7-10]. Until now, most of the studies have pointed at the effect of ESS on olfactory function in patients with pure polyposis or patients with allergic rhinitis; while data on CRS patients with no nasal polyps is limited [11-13]. A recently published meta-analysis reported that ESS improves measures of olfaction in CRS patients with polyposis; but authors have mentioned the necessity of further studies for evaluation of other CRS subgroups. In the present study we aimed to assess the effect of ESS on olfactory function of patients with chronic rhinosinusitis without nasal polyps. This randomized clinical trial was conducted between April 2015 and February 2017 at Baqiyatallah University Hospital, Tehran, Iran. The present study was approved in ethics committee of Baqiyatallah University of Medical Sciences (Reference code: IR.BMSU. REC.1395.10) and registered in Iranian Registry of Clinical Trials (Reference code: IRCT2017050517413N24 ). Figure 1 shows a flowchart of the trial. A total of 30 patients with chronic rhinosinusitis without nasal polyps were needed for this trial. Patients between 18 and 65 years of age who had not responded to standard medical treatment with nasal irrigation by normal saline (4 times daily), nasal corticosteroid Fluticasone (one puff in each nostril daily) and antibiotic therapy by Cefixime (400 mg daily) for 4 weeks, were enrolled in the trial. Patients with history of head trauma or smoking and those who were using drugs that affect taste and smell were excluded from the study . A written informed consent was obtained from all patients. Demographic information as well as drug, trauma and smoking history were recorded in a predesigned checklist. 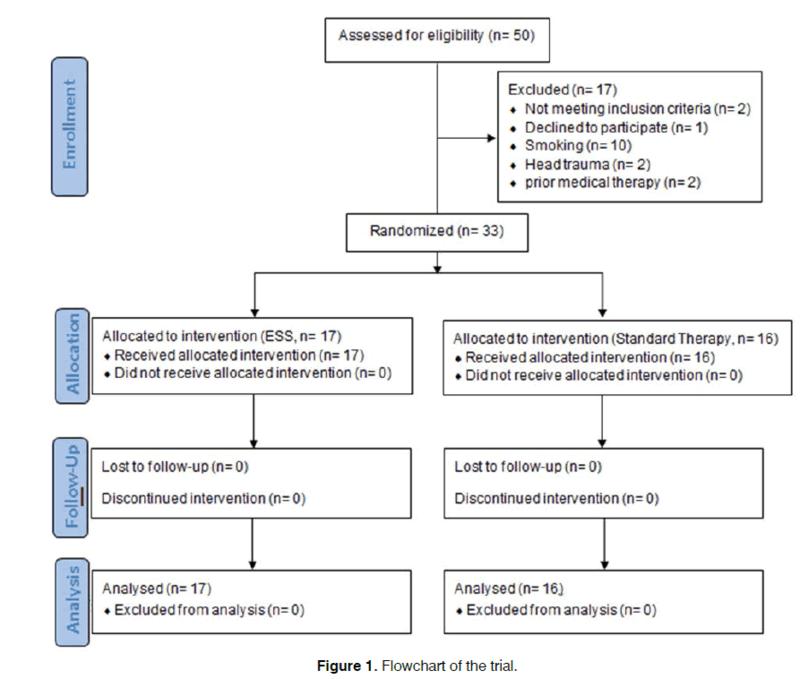 Patients were randomly allocated to two intervention and control groups using random number table; patients in intervention group underwent endoscopic sinus surgery by a single surgeon and olfactory threshold was evaluated using smell threshold test (STT) before, one month and three months after surgery based on Pensylvania University manual . Patients in control group continued standard treatment with nasal irrigation of normal saline (4 times daily) and nasal corticosteroids (one puff in each nostril daily) and olfactory threshold using STT at baseline, one and three months after treatment. Data were analyzed using statistical package for social sciences) SPSS for Windows (version 21, IBM Corp, Armonk, NY). Normal distributed variables (approved by 1-sample Kolmogorov-Smirnov test) were compared using independent sample t test between the groups. The chi square test was used to compare categorical variables in the 2 groups. Mean and standard deviation (SD) were used for describing categorical variables. A p-value of less than 0.05 was considered as statistically significant. Eventually 33 patients with a mean age of 42.70 ± 15.50 years in intervention (13 male and 4 female) and 43.12 ± 11.50 years in control group (10 male and 6 female) underwent analysis (p value=0.930). Mean olfactory threshold was 2.79 ± 0.73 in intervention and 2.67 ± 1.05 in control group prior to intervention (p value=0.345). One month after intervention patients in intervention group had a mean olfactory threshold of 3.10 ± 0.98 and it was 3.06 ± 1.60 for patient in control group. Mean olfactory threshold was 2.92 ± 0.93 for Intervention group and 3.01 ± 1.35 for patients in control group 3 months after intervention. Mean change of olfactory threshold was 0.30 ± 0.79 in intervention and 0.38 ± 1.09 in control group one month after intervention (p value=0.214). Mean change of olfactory threshold was 0.13 ± 0.94 in ESS and 0.33 ± 0.60 in control group three months after intervention (p value=0.196). This change was not also significant for men (p value=0.169) and women (p value=0.371) in ESS group. In addition, in control group mean olfactory changes were not significant for men (p value=0.311) and women (p value=0.139). There was no significant difference in mean olfactory threshold change one and three months after intervention for patients under 40 years of age in both ESS (p value=0.407) and control groups (p=0.637). Also no significant differences were seen for mean olfactory threshold change in patients older than 40 years in ESS (p value=0.783) and control group (p value=0.084) patients. In the present study, mean olfactory threshold of patients in both endoscopic sinus surgery (ESS) and control groups were improved one and three months after intervention; however, these improvements were not statistically significant. In addition, mean changes in olfactory threshold was not significant one and three months after intervention in both study groups. Also three-month improvement of olfactory threshold was not significantly different based on age and gender in both intervention and control group. Previously conducted clinical trials do not reflect surgical treatment for chronic rhinosinusitis (CRS). The most commonly accepted clinical approach is a vast medical treatment and surgery is only considered in patients with persistent symptoms. Regarding this approach, no RCTs had been designed for patients in whom medical treatment is failed . In addition, there are no convincing evidences which indicate an improvement in quality of life of CRS patients after endoscopic sinus surgery . Most of these data did not have control group for a better comparison. In a previous study by Lined et al. the effect of functional endoscopic sinus surgery (FESS) in chronic rhinosinusitis patients with and without nasal polyposis was investigated. In this study 97 patients underwent evaluation one and six months after surgery which showed an effective and rapid improvement in quality of life of patients in both groups. Authors reported a 50% decrease in SNOT-22 one month after intervention which lasted in 6th month after intervention. Also FESS resulted in improvement of patients’ olfactory function which was evaluated by Sniff sticks; however, a small proportion of patients had experienced a worse olfactory function . In concordance with Lined et al., Konstantinidis reported that 74% of CRS patients with polyps had improved olfactory function one year after ESS based on Sniff sticks evaluation . Nguyen et al. assessed quality of life of 65 patients after nasal polyposis surgery using Dynacrone questionnaire before, 6 weeks and 7 months after surgery . Olfactory dysfunction and nasal congestion were the most prevalent symptom of patients before surgery. Symptoms like olfactory dysfunction, nasal congestion, post nasal drainage, rhinorrhea, facial pain and headache were significantly improved after surgery . In another similar study by Saedi et al. they evaluated the effect of endoscopic sinus surgery in 89 chronic rhinosinusitis patients who had undergone longterm medical treatment. In their study 77% of patients had improved olfactory function after surgery. The level of olfactory function was significantly associated with polyp pathology, disease duration, age, smoking and asthma . Evaluating the relation between nasal nitrite oxide (NO) concentration and olfactory function, Elsherif et al. measured this factor before and three months after functional endoscopic sinus surgery (FESS) in chronic rhinosinusitis patients. In their study healthy people had higher levels of respiratory NO and olfactory threshold in comparison with CRS patients. Olfactory threshold and NO concentrations did not change after surgery . Rudmik et al. mentioned that CRS patients who have anosmia and nasal polyp have a higher chance for improvement of olfactory function after endoscopic sinus surgery . In another study by Litvack et al. 111 patients with CRS underwent ESS and were evaluated 6 and 12 months after surgery. The results revealed that patients with hyposmia did not have a remarkable improvement after surgery; while anosmic patients showed a notable improvement in smell identification test (SIT) measures . Evaluating the effect of endoscopic sinus surgery on olfaction in chronic rhinosinusitis patients, Kohli et al. conducted a meta-analysis in which they concluded that ESS has resulted in improvement of all objective and subjective measures of olfaction. They reported that patients with nasal polyposis experienced better improvement; nevertheless, they mentioned that further studies are needed regarding this issue6. In the present study we evaluated only patients with chronic rhinosinusitis without nasal polyposis. In previous studies CRS pateints with and without polyposis were evaluated together for olfactory function after endoscopic surgery and the results were not separated for these two groups. Our study is unique for this issue. Olfactory cleft obstruction by edema and polyps has been mentioned as the potential mechanism of olfactory dysfunction in CRS patients; however, Kern evaluated the biopsies from olfactory mucosa of CRS patients and found inflammatory changes in olfactory epithelium of patients with abnormal odor diagnosis test. It may be because of alteration in primary neuron’s function following inflammatory processes with or without concurrent obstructive mechanism. Our study revealed that changes in olfactory threshold were not significantly different between two ESS and standard medical therapy groups one and three months after intervention. In addition, these changes were not remarkable before and after intervention within the groups. These results suggest that alterations in primary olfactory neuron function in CRS (according kern's study) are not reversed completely with our treatments. Data on the effect of ESS on olfactory function of chronic rhinosinusitis patients without nasal polyps are limited; so further multi-center studies with a larger sample size are recommended for better addressing of this question. Gupta D, Gulati A, Singh I, Tekur U. Impact of endoscopic sinus surgery on olfaction and use of alternative components in odor threshold measurement. Am J Rhinol Allergy. 2015;29(4):e117-e20. Deems DA, Doty RL, Settle RG, Moore-Gillon V, Shaman P, Mester AF, et al. Smell and taste disorders, a study of 750 patients from the University of Pennsylvania Smell and Taste Center. Arch Otolaryngol Head Neck Surg. 1991;117(5):519-28. Delank K, Stoll W. Olfactory function after functional endoscopic sinus surgery for chronic sinusitis. Rhinology. 1998;36(1):15-9. Litvack JR, Mace J, Smith TL. Does olfactory function improve after endoscopic sinus surgery? Otolaryngol Head Neck Surg. 2009;140(3):312-9. Litvack JR, Mace JC, Smith TL. Olfactory function and disease severity in chronic rhinosinusitis. Am J Rhinol Allergy. 2009;23(2):139. Kohli P, Naik AN, Farhood Z, Ong AA, Nguyen SA, Soler ZM, et al. Olfactory Outcomes after Endoscopic Sinus Surgery for Chronic Rhinosinusitis: A Meta-analysis. Otolaryngol Head Neck Surg. 2016;155(6):936-48. Bardaranfar MH, Ranjbar Z, Dadgarnia MH, Atighechi S, Mirvakili A, Behniafard N, et al. The effect of an absorbable gelatin dressing impregnated with triamcinolone within the olfactory cleft on polypoid rhinosinusitis smell disorders. Am J Rhinol Allergy. 2014;28(2):172-5. Bhandarkar ND, Mace JC, Smith TL, editors. The impact of osteitis on disease severity measures and quality of life outcomes in chronic rhinosinusitis. Int Forum Allergy Rhinol. 2011;1(5):372-378. Bunzen DL, Campos A, Leão FS, Morais A, Sperandio F, Neto SC. Efficacy of functional endoscopic sinus surgery for symptoms in chronic rhinosinusitis with or without polyposis. Rev. Bras Otorhinolaryngol. 2006;72(2):242-6. DeConde AS, Mace JC, Alt JA, Soler ZM, Orlandi RR, Smith TL. Investigation of change in cardinal symptoms of chronic rhinosinusitis after surgical or ongoing medical management. Int Forum Allergy Rhinol. 2015;5(1)36-45. Katotomichelakis M, Riga M, Davris S, Tripsianis G, Simopoulou M, Nikolettos N, et al. Allergic rhinitis and aspirin-exacerbated respiratory disease as predictors of the olfactory outcome after endoscopic sinus surgery. Am J Rhinol Allergy. 2009;23(3):348-53. Klimek L, Moll B, Amedee RG, Mann WJ. Olfactory function after microscopic endonasal surgery in patients with nasal polyps. Am J Rhinol. 1997;11(4):251-5. ROWE‐JONES J, Mackay I. A prospective study of olfaction following endoscopic sinus surgery with adjuvant medical treatment. Clin Otolaryngol Allied Sci. 1997;22(4):377-81. Schiffman SS. Taste and smell in disease. N Eng J Med. 1983;308(21):1275-9. Doty RL. The smell threshold test administration manual: Sensonics, Incorporated; 2000. Zachary MS TL. Cummings otolaryngology-Head and neck surgery, 6th Edition Philadelphia: Mosby; 2015. Lind H, Joergensen G, Lange B, Svendstrup F, Kjeldsen A. Efficacy of ESS in chronic rhinosinusitis with and without nasal polyposis: a Danish cohort study. Eur Arch Otorhinolaryngol. 2016;273(4):911-9. Konstantinidis I, Witt M, Kaidoglou K, Constantinidis J, Gudziol V. Olfactory mucosa in nasal polyposis: implications for FESS outcome. Rhinology. 2010;48(1):47-53. Nguyen DT, Guillemin F, Arous F, Jankowski R. Assessment of quality-of-life outcomes after surgery for nasal polyposis with the DyNaChron questionnaire. Eur Arch Otorhinolaryngol. 2015;272(2):367-75. Saedi B, Sadeghi M, Yazdani N, Afshari A. Effectiveness of FESS in smell improvement of sinusitis patients. Indian J Otolaryngol Head Neck Surg. 2013;65(2):283-7. Elsherif H, Landis B, Hamad M, Hugentobler M, Bahig S, Gamaa A, et al. Olfactory function and nasal nitric oxide. Clin Otolaryngol. 2007;32(5):356-60. Rudmik L, Smith TL. Olfactory improvement after endoscopic sinus surgery. Curr Opin Otolaryngol Head Neck Surg. 2012;20(1):29. Paper submitted to the ITJ-EM (Editorial Manager System) on June 06, 2018; and accepted on June 24, 2018. Citation: Yousef J, Madarshahi H, Akhavan A, Taheri A, Saeedi M, Bagherihagh A, Hossein MA, Khosravi MA. Effect of ESS on Olfactory Threshold of Patients with CRS without Nasal Polyps. Int Tinnitus J. 2018;22(1):89-92.